The south front of Thoresby Hall, c.1900. The house was designed by Anthony Salvin and erected in 1865-75. The hall has recently been converted into a hotel. THE Duke of Westminster, during a visit to Lord Manvers at Thoresby Park, was surprised to find one of the grandest houses in England in the midst of a forest, where " Norman kings once hunted, and Saxon outlaws plundered." 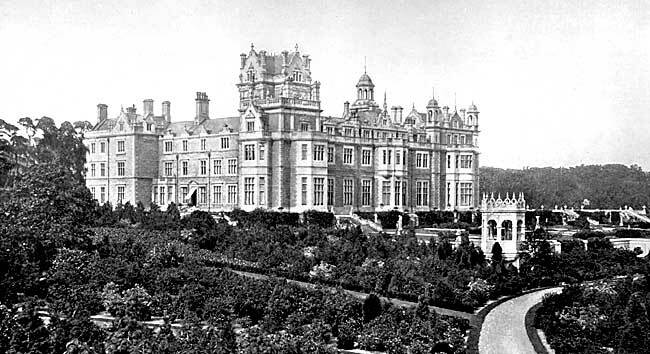 Vast and ornate, Thoresby stands in the heart of a forest, which the axe and the plough have not yet invaded; a palatial residence, far removed from busy scenes. Thoresby, beyond a doubt, is one of the stateliest of the many noblemens mansions, which are scattered over this island ; it would be the fitting habitation of Royalty, and its situation gives it an advantage and a charm, which. scarcely any other residence in the country possesses. In 1745, the Duke of Kingstons residence, at Thoresby, was destroyed by fire, and but very little was saved from the wreck. In its place, the second, and last, Duke of Kingston built a house of considerable magnificence at the foot of a beautiful grove of Spanish chestnuts, set in regular array, which are now flourishing in the same soft turf, and in the same fertile soil which nurtured them then. This house, having served as the family residence for two generations, was rased to the ground by the present Earl Manvers, and further away from the Chestnut Grove, and the little stream, which carries away the overflow from a broad and pellucid lake, his lordship caused to be built the present magnificent mansion. In a short article it would be impossible to present anything like an adequate description of Thoresby, and even given the command of unlimited columnial space, I could not hope to furnish a satisfactory detailed account of Earl Manvers princely residence. Outside, one is struck by the imposing look of the place, with its massive stonework, moulded windows, and tooled quoins and dressings. Inside, one is dazzled by much magnificence, and one leaves the house with confused memories of satin-covered walls, tapestry curtains, statutary mantelpieces, and gilded ceilings. To give some idea of the size of this great house, which is the boast of the north of the county, it may be stated here that the main fronts measure 180 feet on the east and principal entrance, and 159 on the west, and 182 on the south. Thoresby, though it does not strictly come in the category of "show places," is yet, so to speak, open to the public, for when the family is away in London, or elsewhereand their absence usually extends over several months in each yearparties of pleasure-takers and tourists are allowed to see the house. Lord Manvers does not believe in that exclusiveness, which shuts the doors of some of these private places against those who know how to appreciate the beautiful objects they enshrine. By reason of Lord Manvers liberality, the splendours of Thoresby are pretty widely known, in this county, at any rate. The central hall, for instance, has been admired by scores of tourists, as the visitors book on the table there, containing many familiar names, will tell. Its stone walls are as white as when the material of which they are composed was first smoothed, and from the hammer-beam roof to the floor of patterned oak, it has a look of imposing newness. All the oak in the room, and there is a great deal of it, was grown in the adjoining forest. The stone arches, which support the music gallery at one end, are perpetuated on the wall behind, where brightly burnished bayonets are arranged in arch form. At the other end of the hall, which is sixty-five feet long, stand two grim-looking suits of armour, which, placed in an upright position, surmounted with visors, and possessed each with a sword, look like ghostly knights of old. Other portions of the wall are occupied by weapons of curious shape, arranged in graceful devices. There are some family pictures here, including the second Duke of Kingston, on whose death that dukedom became extinct. The last dukes only sister, Lady Francis Pierrepont, who married, in 1734, Mr. Philip Meadows, the son of Sir Philip of that name, is not far removed from her brother on these walls. There is also a large oil painting of Lady Manvers great-grandfather, Francois de Franquetot, Duc de Coigny, representing this distinguished French nobleman on horseback. The large picture over the handsome chimneypicce is evidently by some well known artist, but I am wholly unacquainted with the three wigged figurespresumably persons of high rankwho are engaged in amicable converse over some rare golden wine, supplied from a flask which stands on the table. Another portrait worth noticing is that of the celebrated Lady Wortley Montague, the eldest daughter of the first Duke of Kingston. This remarkable lady was born as Thoresby. The dining room at Thoresby contains some choice modern pictures, which have been chosen with much good taste. It is a beautiful room, with doors and panels of polished walnut, and a fine ceiling, the upper part of the room being surrounded by a deep and beautiful frieze. The large sideboard looks like a piece of foreign furniture, whilst the two smaller ones are the work of a local carver. On these walls hang portraits of the Earl and Countess Manvers, the former in his uniform of Colonel of the South Notts. Yeomanry; her ladyship, in a dress of white satin, a small vase of flowers occupying her attention. Both are unmistakeably good likenesses. The other portraits in the dining room are of the fifth Earl, afterwards Marquis of Dorchester, and first Duke of Kingston, who died in 1725; of the Duchess, his second wife; and of Lady Isabella Bentinck, daughter of the Earl of Portland, all fine specimens of portrait painting. If one were asked to make a choice from the half-dozen large modern paintings in this dining room they are all good and carefully selectedI think it would fall upon that by Creswick, who, notwithstanding the fault that has sometimes been attributed to him, that of giving too much effect to the coldness of our northern atmosphere, occupies a leading place amongst modern landscape painters. The sheep form the prominent feature of this picture, and there is a wooliness about them, and a life in the shepherd dog, which strike one as much as the fine atmospheric effect in the background, and the faithful rendering of the tall trees. Vicat Coles picture of a mill, with the translucent water and reedy detail, which was painted as late as 1872, arrests ones attention, and is one of that painters best efforts. It is evening, and the sky has that purple tone, which one sometimes sees at the close of a summer day. There is a large painting of the " Old Steps at Margate, with a warm sunlight on the rocks, and a restless sea. There is some very skilful management of colour in Milbyes picture of a Spanish vessel at sea; a deep purple glow is upon the waves, and over the whole scene is the glamour of sunset. To get to the library you have to pass through a small drawing room, with curtains of rare Gobelin tapestry, and great doors of polished maple of the American and British varieties. The library is large and quiet; the stillness of that large, bright room, with its rows of handsomely bound volumes of English, foreign, and classic literature is unbroken by the faintest sound. The most noticeable object here is the chimneypiece, which is a piece of elaborate and beautiful carving, displaying remarkable artistic skill; one can scarcely imagine that the material from which it is wrought once grew on the estate. Almost every knot in the venerable Major Oak is here produced in miniature, and in kindred substance; there is a herd of deer, and the spreading fronds of forest fern, the piece being supported on either side the fire place by statuettes of Robin Hood and Little John, the whole oak-covered. This piece of work, is about fifteen feet high, and ten feet wide. Above the bookcases are ranged portraits of kings, queens, and nobles. There are the Dukes of York and Gloucester, and Charles II., by Nason, a Dutch artist who visited England in the reign of the Second Charles ; Prince George, of Denmark, by Verlest, whose arrogance lost him the patronage of Lord Chancellor Shaftesbury ; of Queen Anne, and George the Third, and of Mary, the last painted by Godfrey Kneller; of William III., from the brush of Wyck, and some family portaits by eminent artists, The ceiling of this room, is like that of the other principal rooms, highly ornamented. The floor is of oak with parquetrie bordering. The drawing room is a very handsome apartment. The crystal pendants of the massive chandeliers hang from a rich coffered ceiling, ornamented with pink and blue, and gold, sparkle in the light. The walls, to the length of fifty-three feetthat is the length of the room, are covered with blue satin, with graceful floral figurings of silver grey, and the curtains are of tapestry. With the same costly fabric much of the furniture is covered, whilst other of the gilded pieces are draped with worked silk of splendid texture, or with the richest velvet. The mantel-pieces are of statuary marble, snow-white. Everywhere appears rare ornaments ; on the mantelpieces there are some fine specimens of Sevres china, and at the end of the room there is a massive vase, mounted on a handsome pedestal, which was presented to Lady Manvers by the Empress Eugenic, in 1854. There are ornamental timepieces encased in rare chinaand in the recesses are brazen Cupids, making vain attempts to fly away with brackets, on which are some dozen candle holders. Satin wood, birds eye, and foreign maple, walnut wood, and oak have been employed in forming the more substantial fittings of the drawing room, and the carpet is of the choicest Indian manufacture. 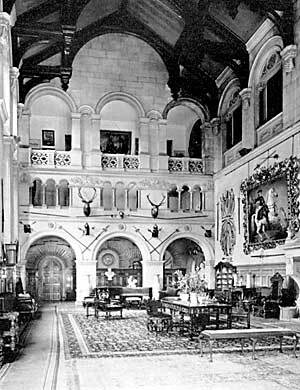 The Great Hall at Thoresby in the 1930s. It seems that at Thoresby, art has exhausted its invention, and that wealth has offered all its resourses. In every part of the house the same aspect of completeness and magnificence is apparent. There are over a hundred bed rooms in the building, and the principal of these are furnished with dressing rooms of the size of an ordinary sleeping apartment. From the windows of some of these rooms there are lovely views. Away in the distance you can see clusters of great forest trees. To the right, the silvery surface of a great lake, which covers sixty-five acres, shows itself, and nearer still, the foam of a turbulent little waterfall catches the eye, whilst beyond the beautifully kept gardens, and the great broad terrace, is the park and forest, with its numerous herd of deer. In traversing the landings, one comes upon occasional specimens of tapestry, and there are one or two large pictures commemorating French martial events, in which Lady Manvers ancestors played a leading part. The walls of the Countess boudoir are pannelled with rich Aubisson tapestry, and the curtains are in part composed of the same rare fabric. The mantelpiece is of white marble, a treasure which has been transplanted from some Italian palace. There are three carved figures of Cupid on each side, each figure holding shell-fish, or fruit in the hand. The chairs and other articles of furniture are covered with worked silk and tapestry. One side is occupied by a low book case, containing a small collection of good standard literature. When her ladyship is not here, writing letters and reading, in all probability she will be interesting herself in the welfare of some of the children who attend the little school at Perlethorpe. Lady Manvers, it may be here mentioned, is the second daughter of the Duc de Coigny, of France, and sister to the Countess of Stair. She was married to Earl Manvers in 1852, eight years before he succeeded to the earldom. The first Thoresby was remodelled in 1685-7 from a house built in Charles I's reign; it was burnt down in 1745 "when nothing was saved from the ravages of that fire, but the writings, plate, and some little of the best furniture" (Throsby, 1790). Thoresby Park covers about 2,000 acres and is some ten miles in circumference. The estate embraces a vast tract of forest land studded in some places with mighty and vigorous oaks, in others with graceful beeches, and the Spanish chestnut with its bosses of prickly husks flourishes in the fertile forest soil. The wide-spreading, undulating ground is covered, far as the eye can range, with a sturdy undergrowth of fern, which, in the fall of the year, becomes golden or reddish brown. There is every combination and variety of woodland scenery here, and it is as still in these sylvan wilds as in any primeval forest. This surely was the very forest where the day-dreams of Coningsby, on his way to Nottingham, were put an end to by a storm which made the oaks and beeches express their terror or their agony. The pleasure grounds of Thoresby are severed from the forest by a sunken fence, which is a sure protection against the inroads of cattle or deer. They are thickly studded with tall vigorous trees, and intersected by a shallow stream, which after making a foamy waterfall, calms itself in a smoother bed, and so pursues its way. The broad and clear lake which extends into the forest as far as one can see, is fed by the Medin. The pike and the perch thrive in its deep waters, and the coot rears her young in the thick growth which fringes its margin. Outside the pale of the pleasure grounds are the workshops, wood-yard, and gas works, which are ever busy, and they are large enough to do the work of a small town. The machine shops contain the best inventions in the way of machinery, and the works regularly employ a number of hands. There are circular saws and hand saws, and upon the floor are piles of oak and ash, which will be drilled and grooved for all manner of purposes on the estate. The most skilled workmen are employed here; joiners, sawyers, and machinists, and if one did not know that the whole of Lord Manvers large estates were supplied from these workshops, one would be at a loss to know what was done with all this woodwork which keeps a powerful engine perpetually on the move. The clerk of the works has his permanent office here, and everything is done in the most systematic and regular manner. The gas works are close by, and here there are two gasometers, retorts, and all the requisite appliances for making sufficient gas to supply the hall, the church, and other places. All this in the heart of a forest where "Norman kings once hunted and Saxon outlaws plundered."